With the growing popularity of Film Burns Effects, we thought we would make some free ones for Final Cut Pro X! Rather than having to mess with things like blend modes, we’ve gone ahead and already made them into FCPX Effects and Transitions that you can easily install. 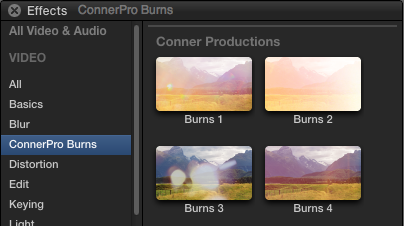 Conner Production’s Free Film Burns (For Final Cut Pro) comes with four unique Burns Effects and two Unique Burns Transitions. Tip: The Burns look best on clips that are about 5-15 seconds long. Have fun with these and don’t overuse them!